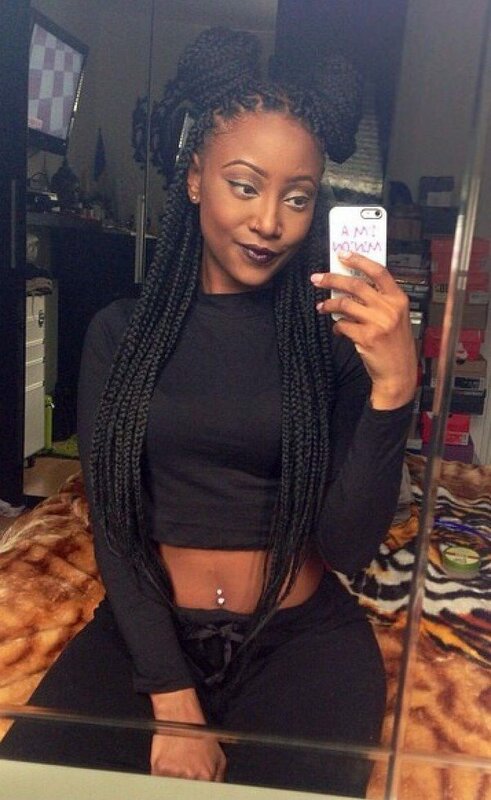 Box braids have always been a popular style choice. 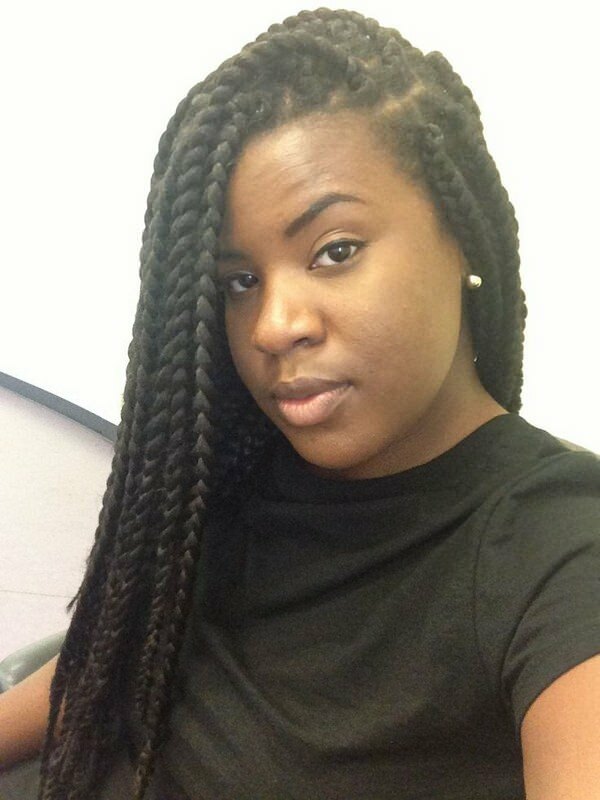 Sometimes it seems wherever you go you can see women rocking box braids in jumbo size. They are a very versatile style, so that has a lot to do with their popularity. 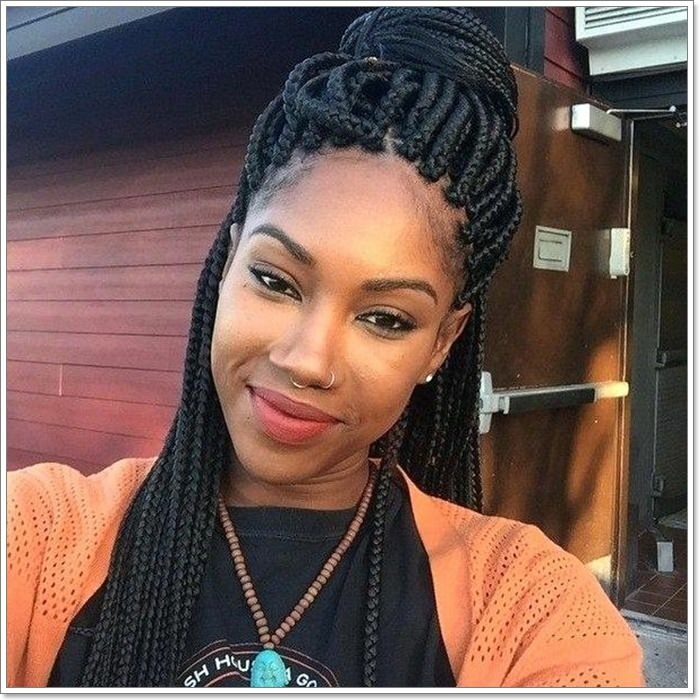 These braids have been around for a long time, way back to the 90’s when Janet Jackson appeared in the movie Poetic Justice wearing box braids. The braids were soon renamed after the movie because Janet Jackson caused quite a stir wearing those braids. The iconic look grew in popularity, and it’s still growing strong to this day. 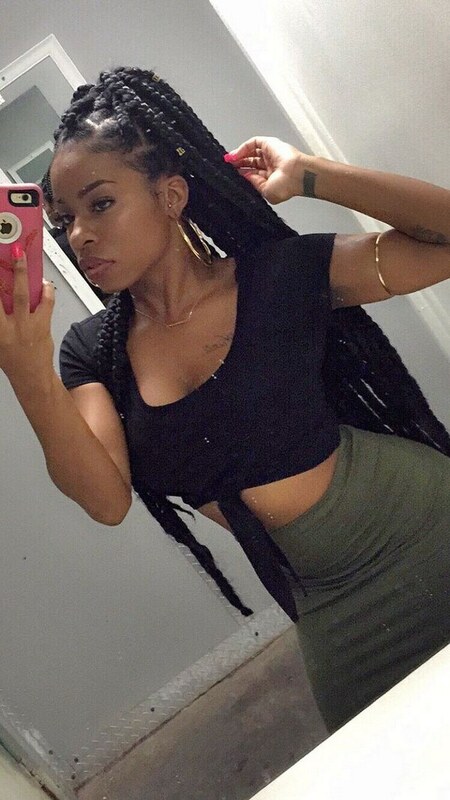 The great thing about box braids is that it’s like giving your hair a vacation from life. 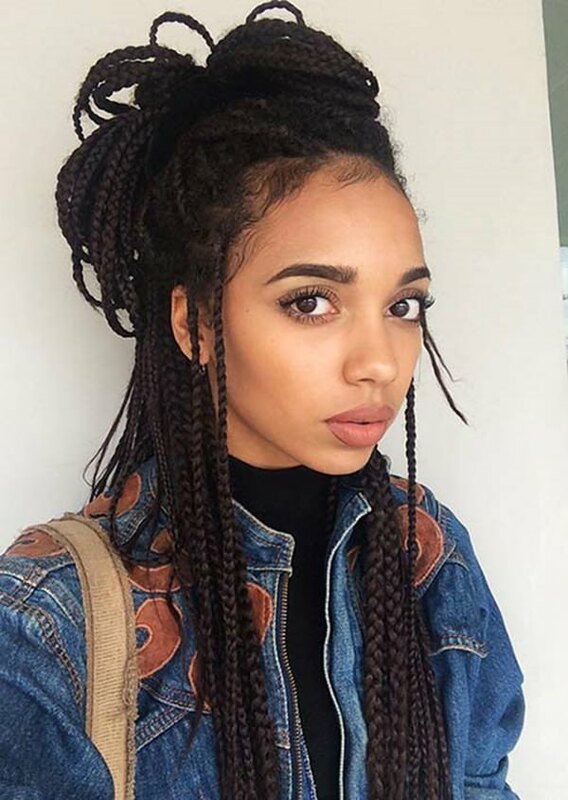 By adding box braids to your hair, you are actually adding a little protective layer to your natural hair. It can not only protect the hair that you have but also extend the life of it. 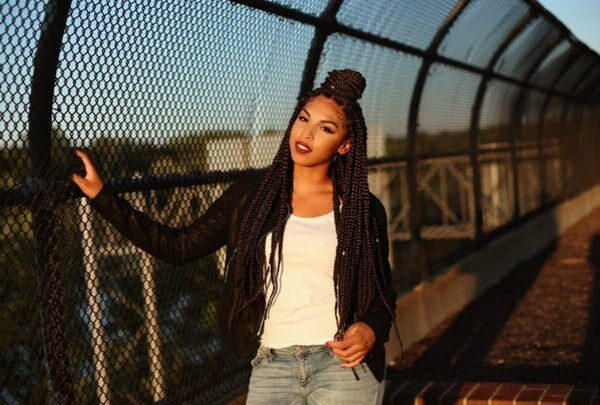 Box braids usually come in much longer styles so you can have the versatility to rock any hairstyle choice that you want. Once the extensions have been installed by a stylist, the sky is the limit when it comes to hairstyle choices. 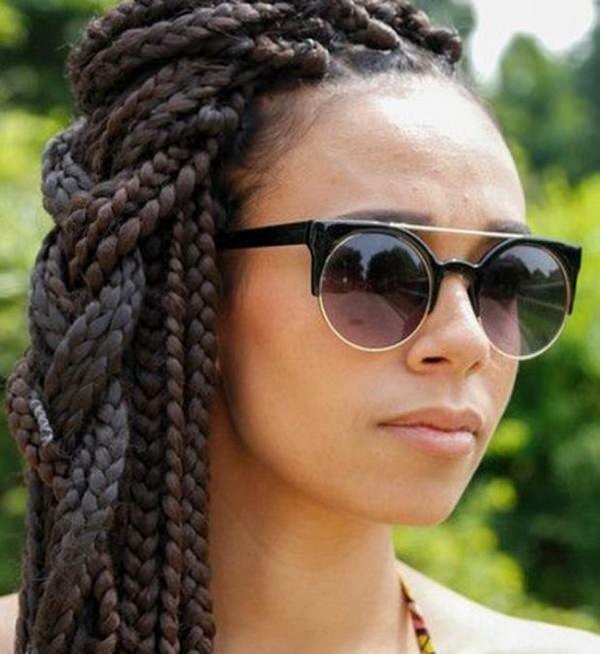 Your natural hair is protected because the box braids overlap it so that the sun and environmental damages can’t get to it. It’s great protection for your hair during the winter months when the harsh winters can wreak havoc on your hair. 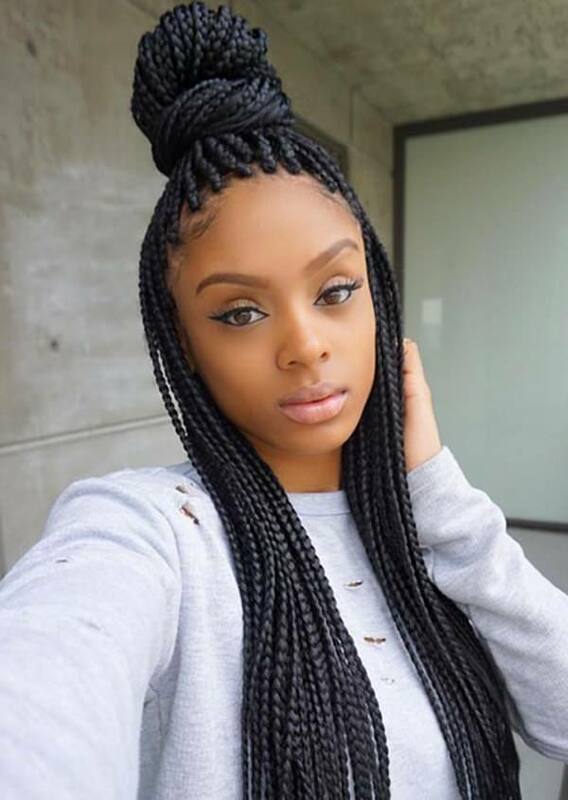 Box braids can last up to three months which allows you months of low maintenance style. 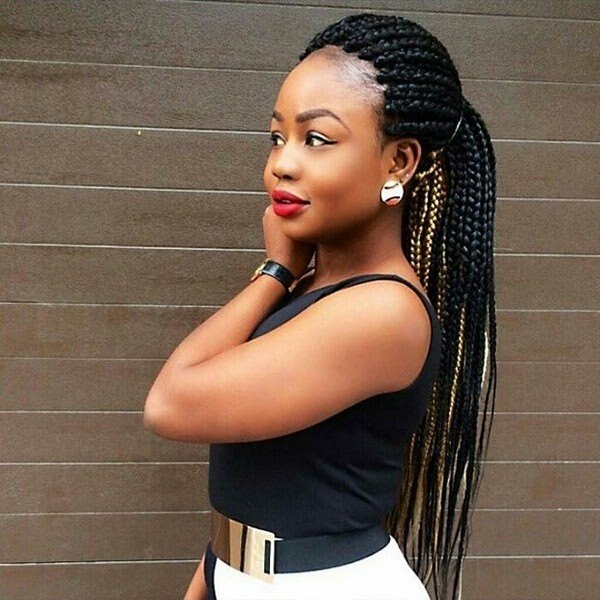 The box braids can be used as a casual look and left down or styled into an elegant updo for your next event. It’s a trendy and chic style that is always popular. 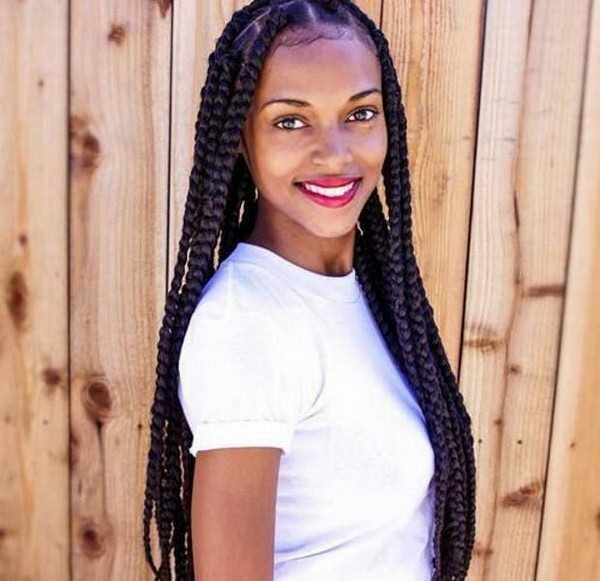 There are many different style choices when it comes to the box braids. 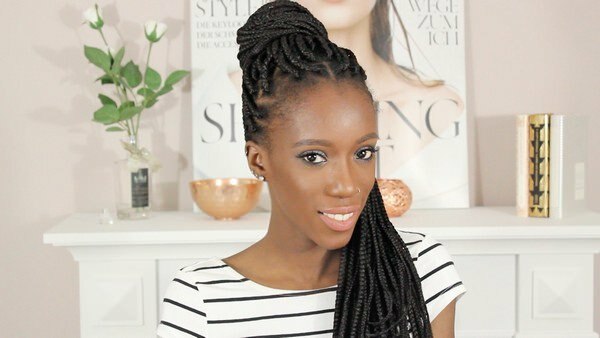 There are virtually thousands of different ways to style box braids. 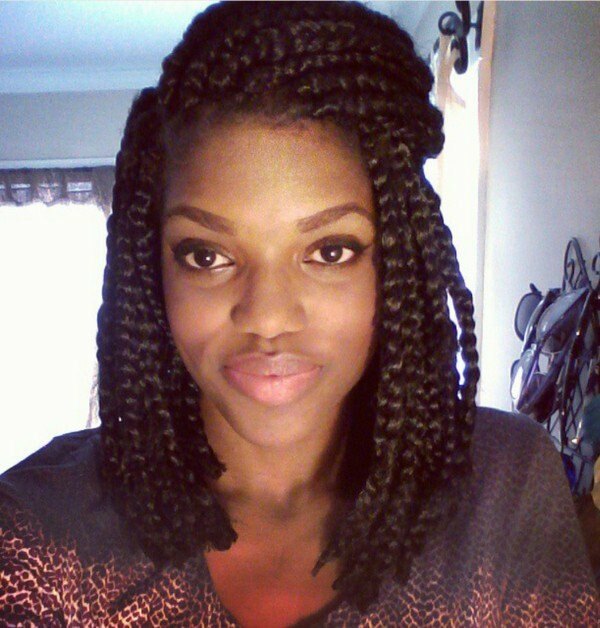 Experimenting with different styles is the fun part of having box braids. We have provided you with many different style choices that you can use on your next appointment to the salon. 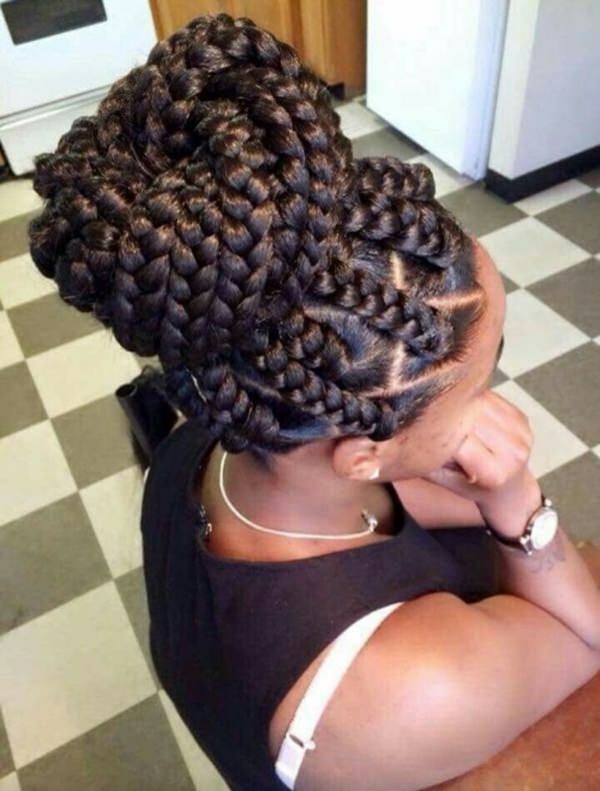 Just make sure that you have a skilled stylist so that the braiding experience isn’t torture. 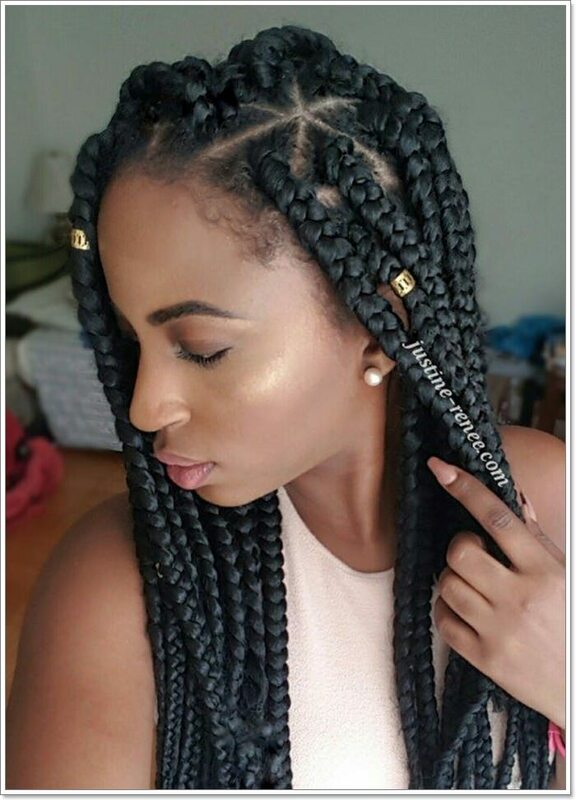 Be aware that getting box braids can take up to 5-8 hours to complete. 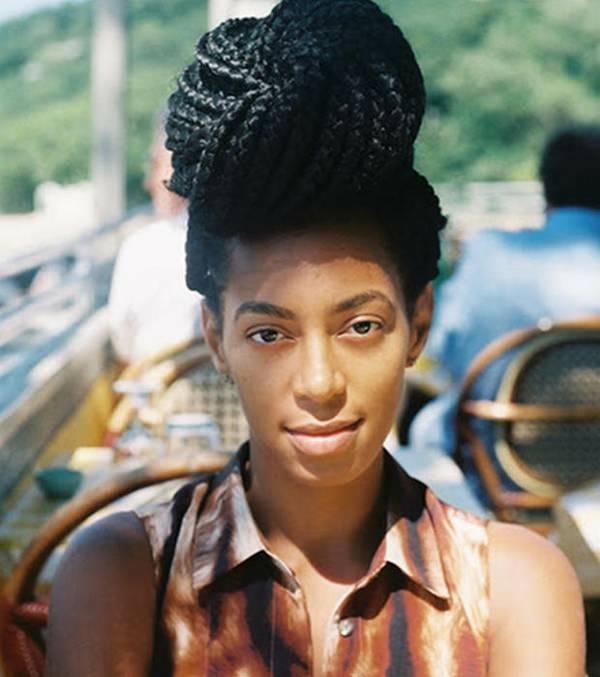 These thin braids are spiraled and pulled up to create an elegant bun. Try an updo that is half up and half down. 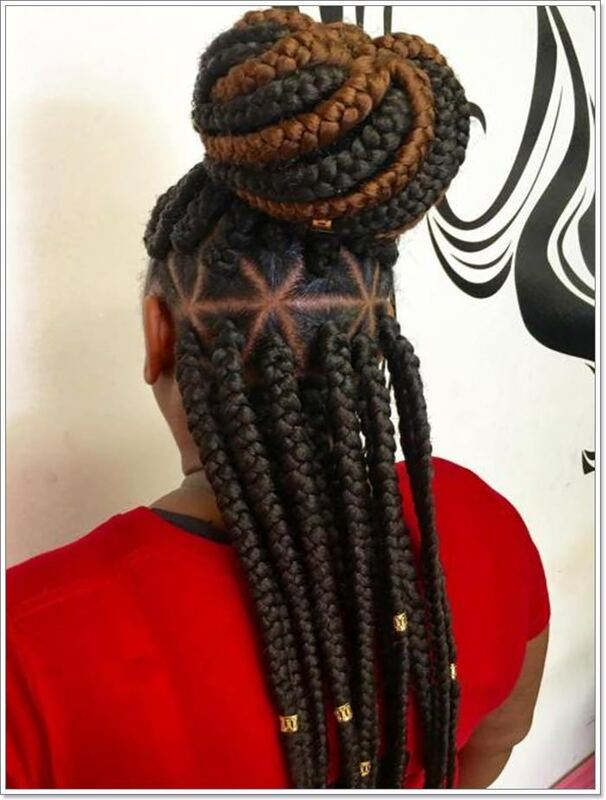 The bun is also a creative design. 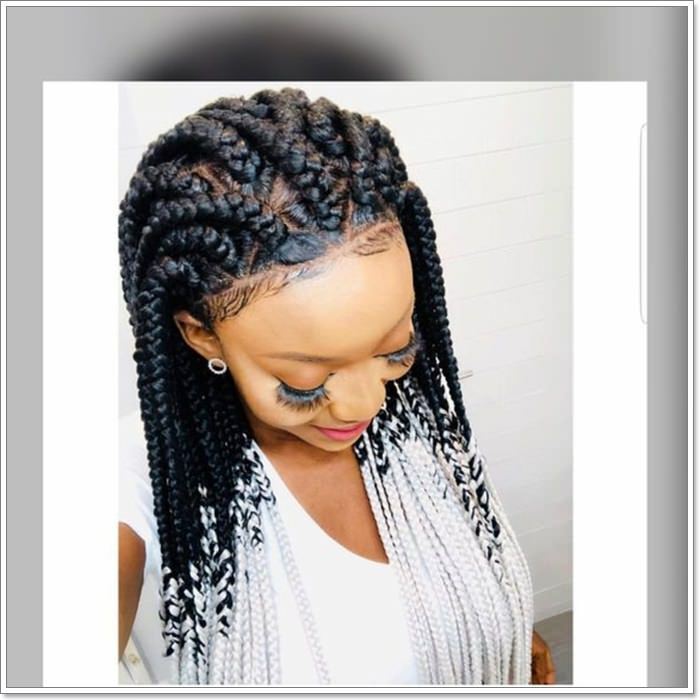 Create a hair piece with your braids. This beautiful design would be great for your next event. 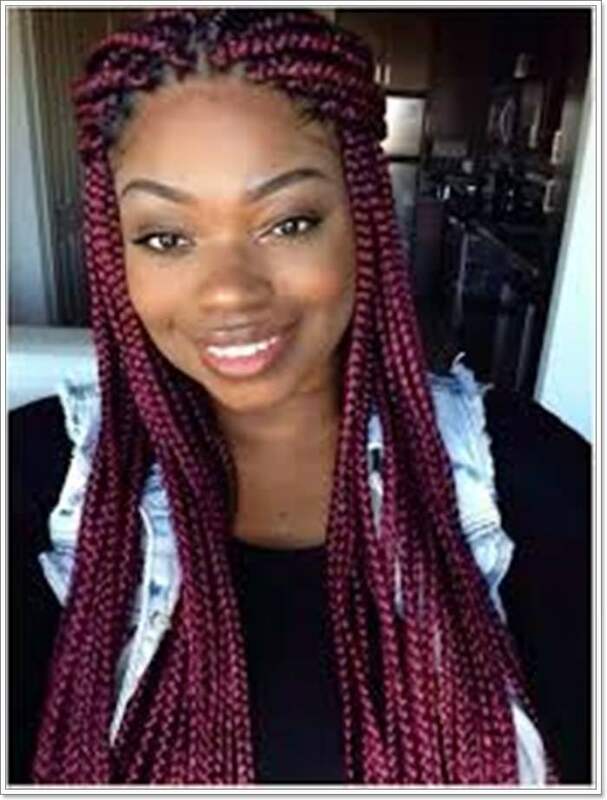 Getting box braids is a great time to experiment with color, as there is no damage to your natural hair. This bright blue is a knockout color choice. This is a great style that works with any casual day. 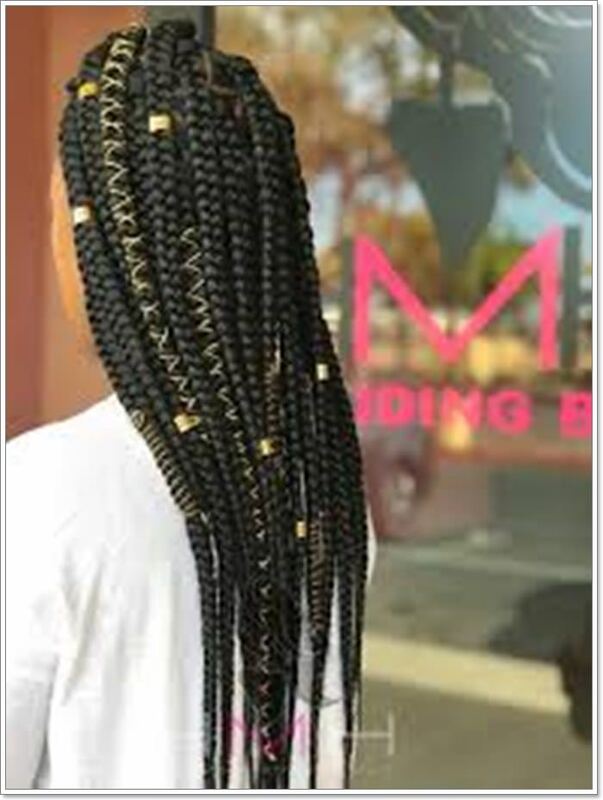 The braids are really thin which offers a different look. These crazy color choices will have you feeling wild. If you want to try a bold look color is the best way to do it. 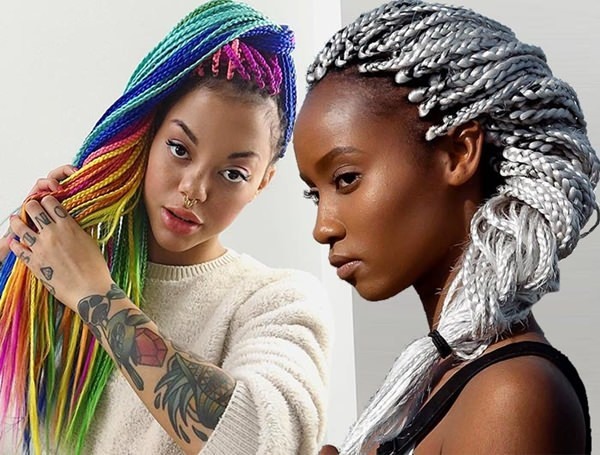 These color choices are great examples of the fun you can have with experimenting on box braids. 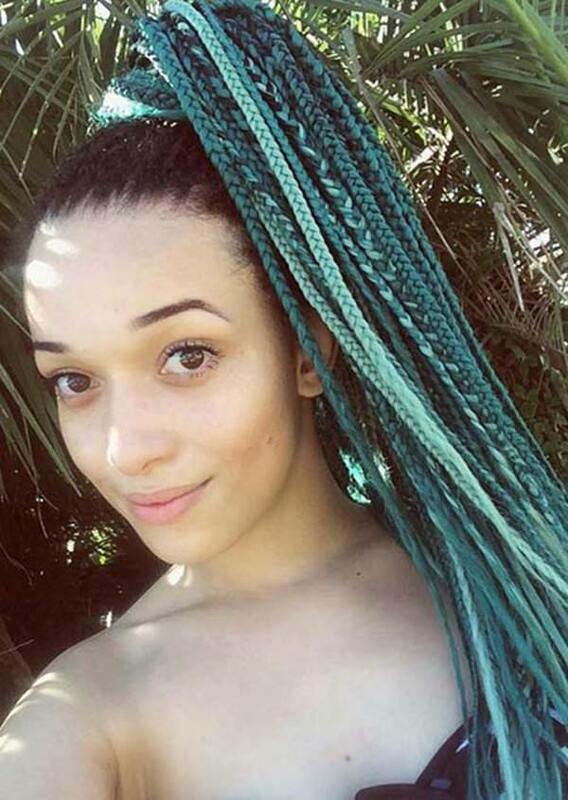 The base of the hair is left natural while the braids are teal. These gorgeous pigtails are made with large and small braids which create a stunning look. 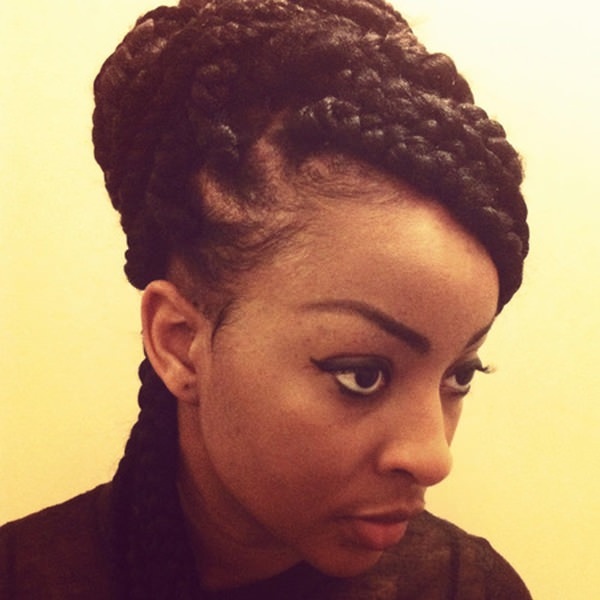 Box braids can be braided into your hair in any design of your choosing. 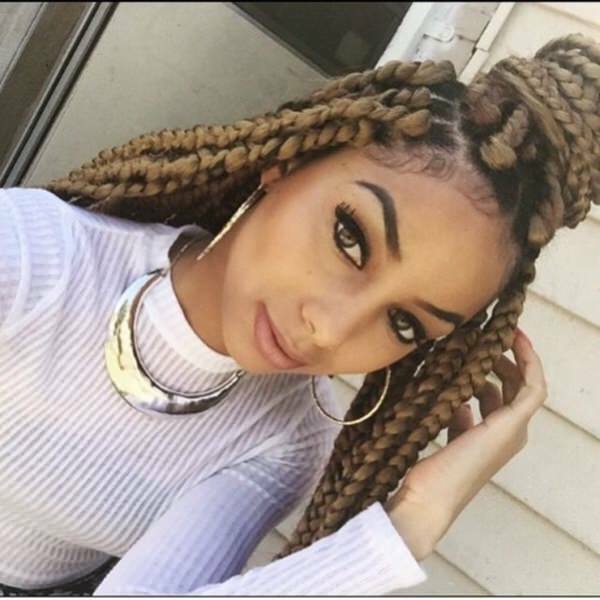 Box braids come in many different shapes and sizes to achieve any look that you desire. 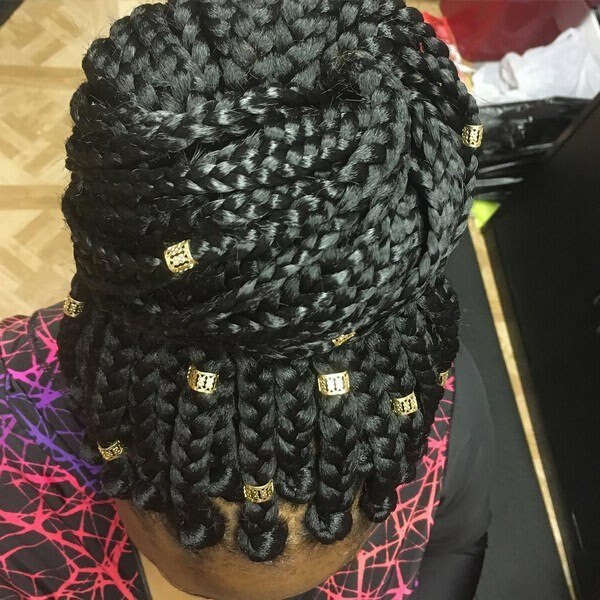 These jumbo braids are pulled back into an exquisite ponytail. 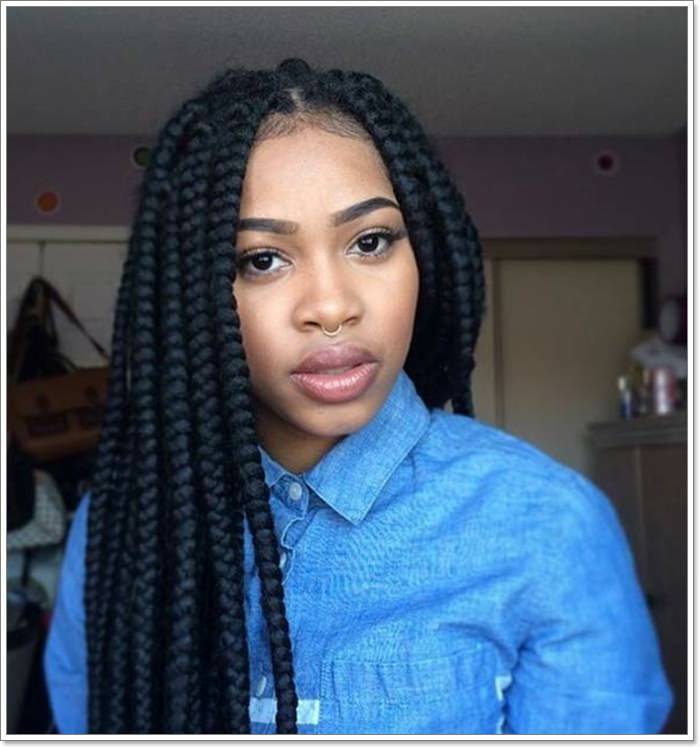 Another example of the versatility of the box braids and the many different styles you can achieve. 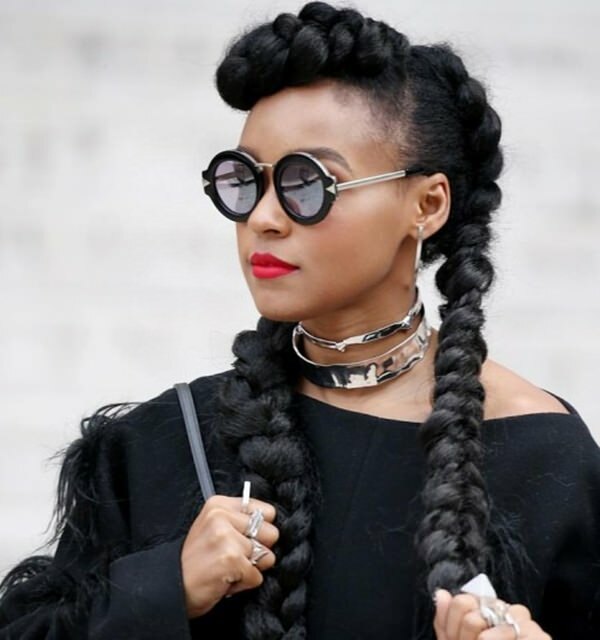 Short styles can be just as fashionable as the long braids. 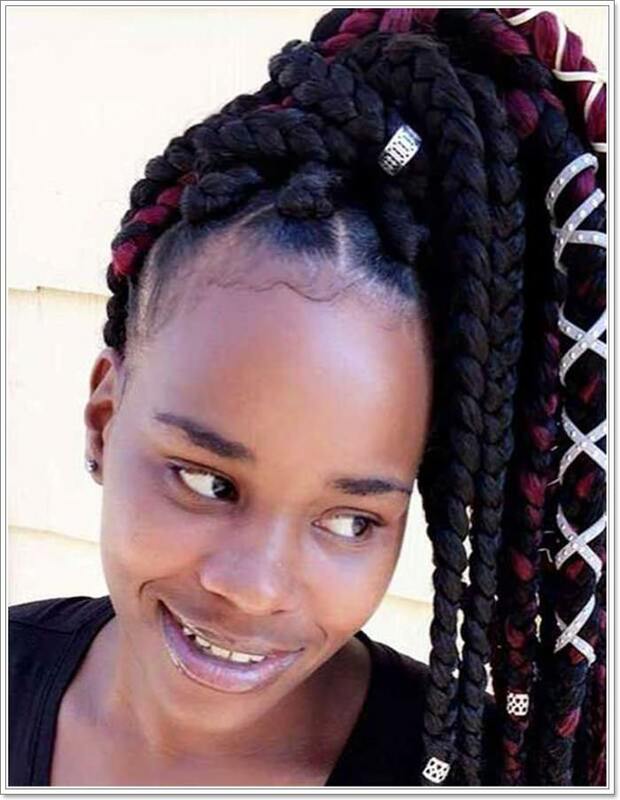 She has a side part, and the braids are cut short. 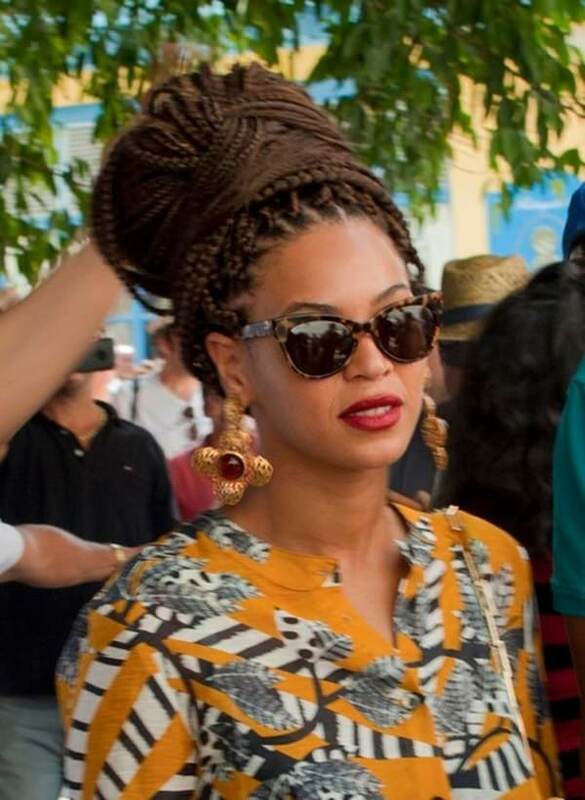 Beyonce knows how to rock a box braid style and the color really warms up the whole look. 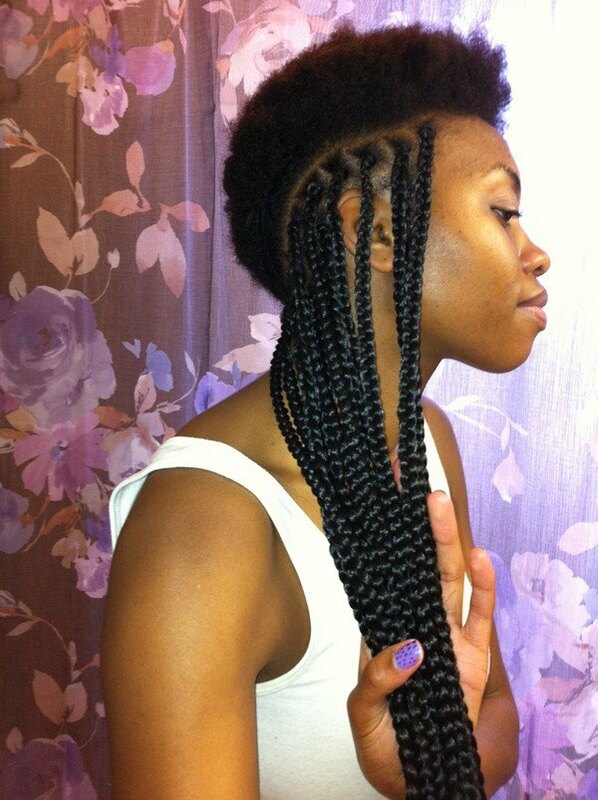 Use your braids to create one large braid to achieve this beautiful design. 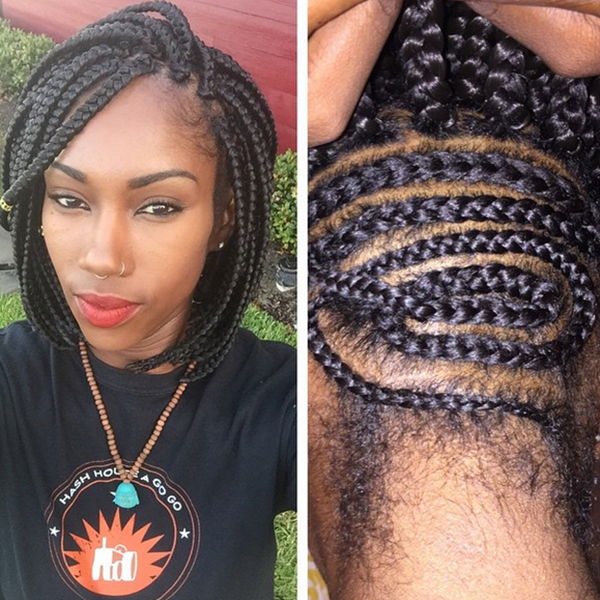 Another form of the box braids is twisted braids. It gives you a completely different look. A gorgeous style that can be used for any event. 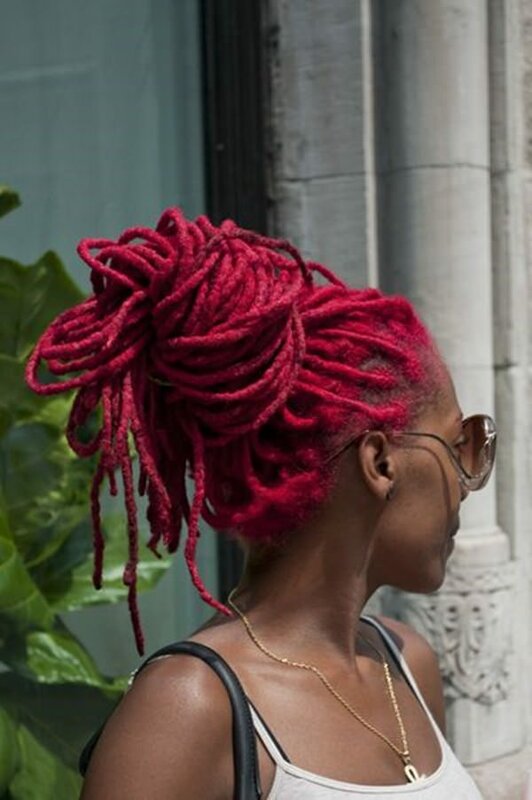 A bright red style that works well for a double bun. 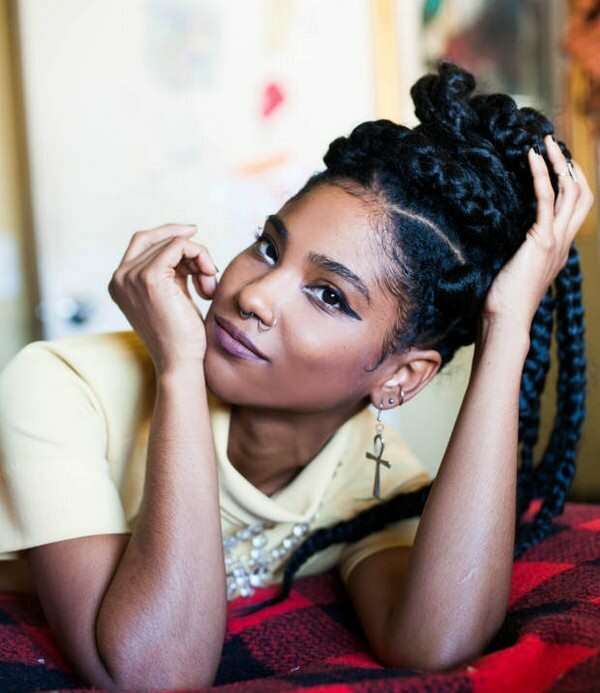 Use your thin braids to create a high ponytail style. 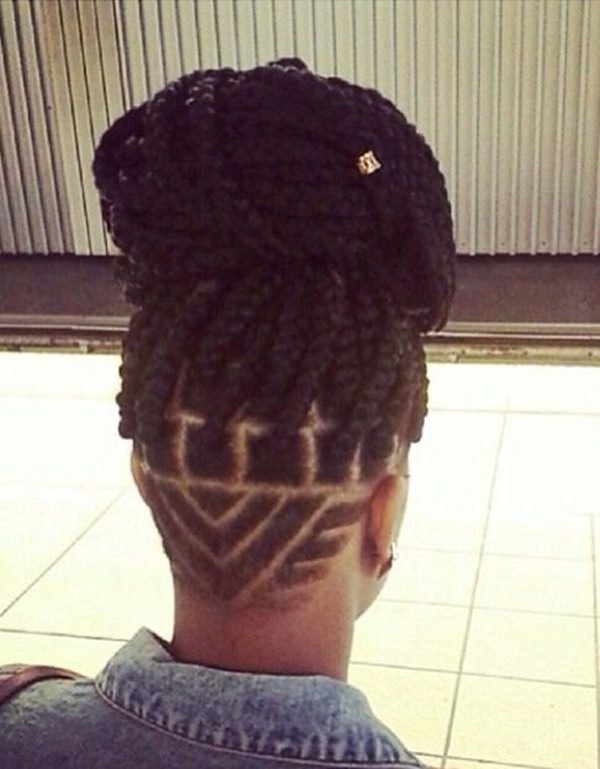 This creative bun is definitely one that can be considered high fashion. A great look for the office or an event, this ponytail screams of sophistication and elegance. This is a great example of what it’s like getting box braids. It’s a long process that takes patience. 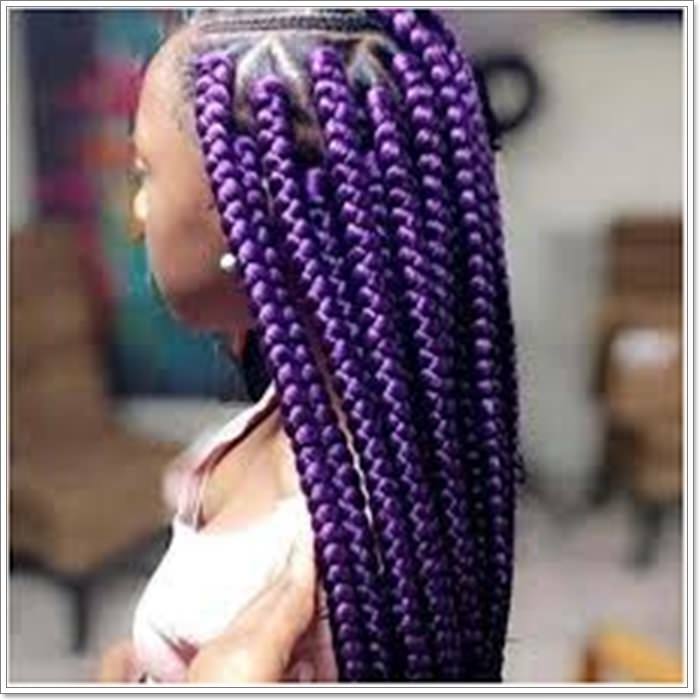 The braids are created layer by layer. 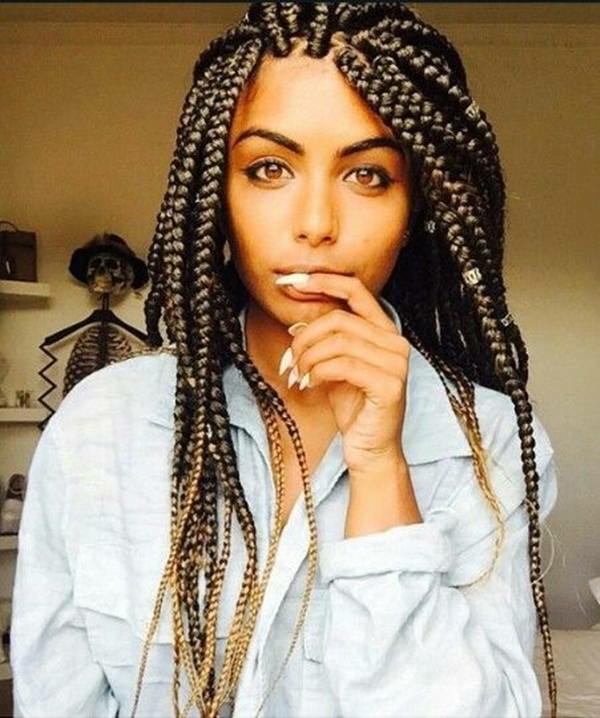 Leave your braids down and create a side part to add volume to your look. 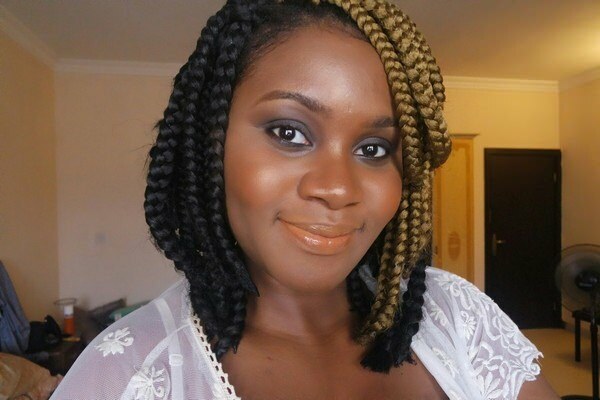 Another example of the different styles box braids can give you. 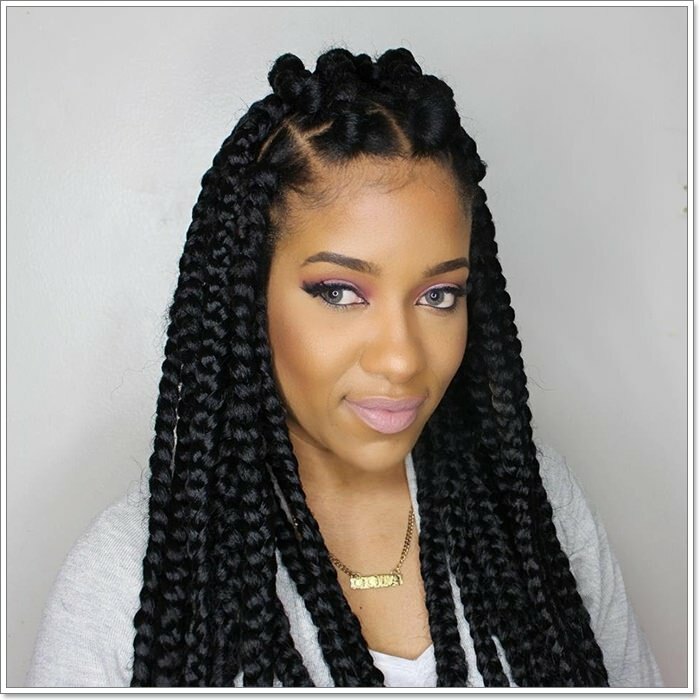 This is a unique look that has the braids gathered to the side to create a whole new braid. It’s a fashionable choice that’s truly different. 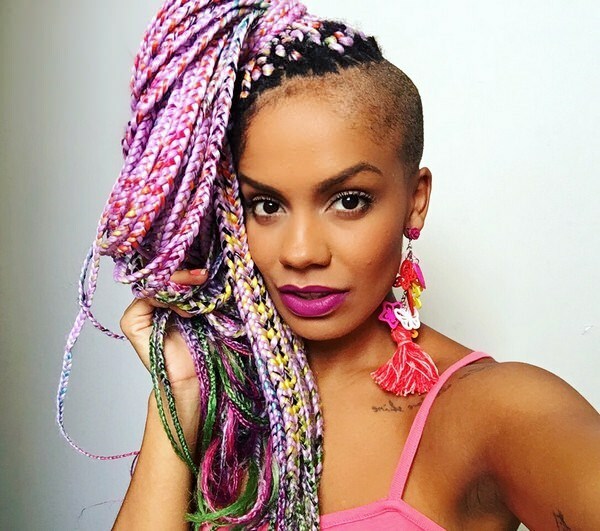 A great example of color experimentation with box braids. Why not try an outrageous purple when you don’t have to worry about damaging your hair. Stunning color! A beautiful ponytail design that is eye-catching. She has added a few highlights to the bottom that really makes the look stand out. A great way to make your next updo shine is to add accessories; it can change the whole look. You can change your whole look by adding some bangs to your style. The rest of her hair is pulled back while the bangs go across her forehead. 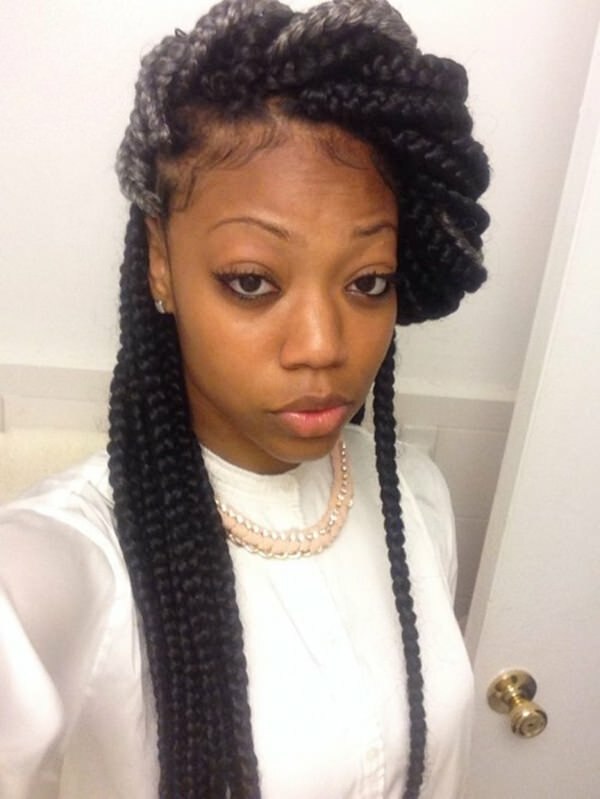 These braids start off large at the scalp but then grow smaller as they go to the bottom. It’s a great look that gives you some originality. Another example of the partial updo with a bun on top with some of the braids left down. 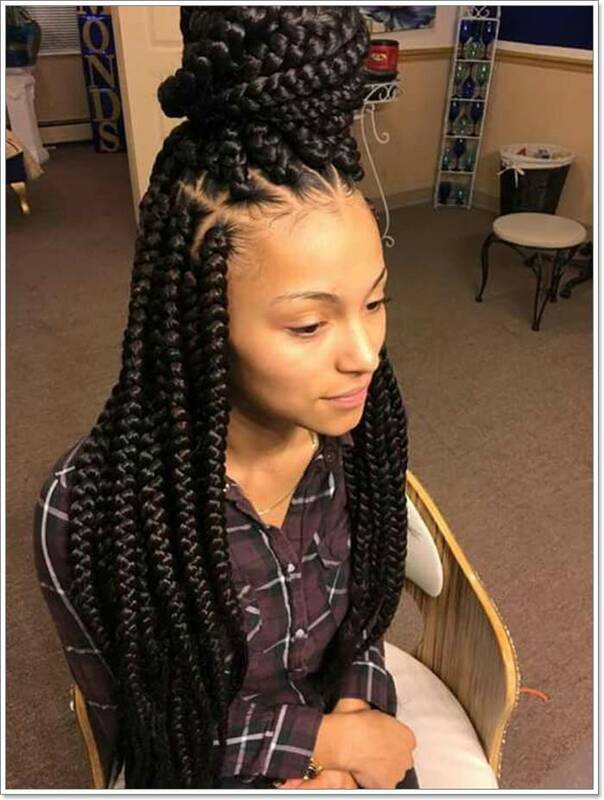 These braids are jumbo which gives you a completely different look. 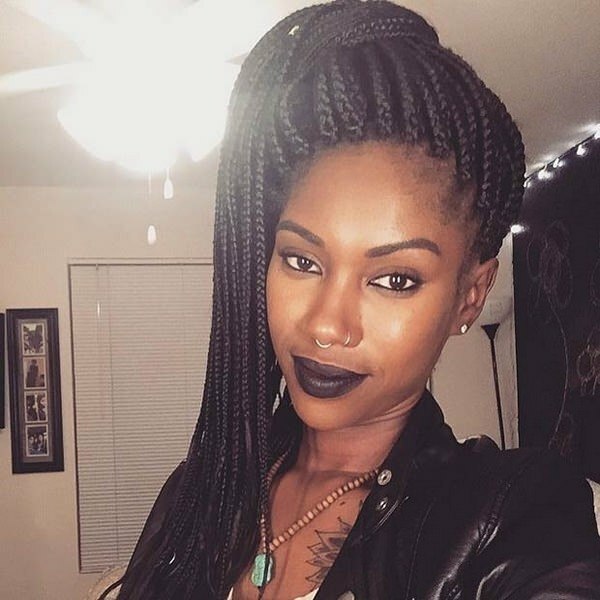 The side part adds more volume, but it’s not needed due to the size of the braid. Why not try every color under the sun? 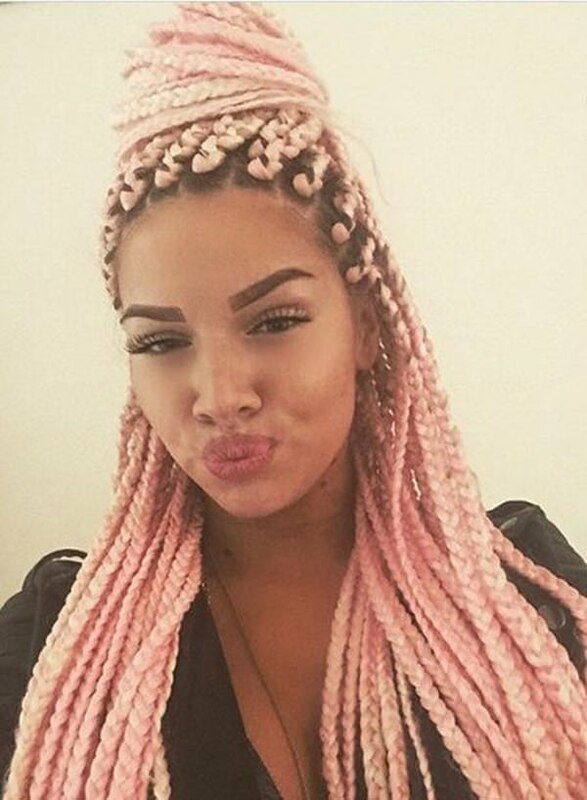 These beautiful braids are all pastel colors, and the combination is quite beautiful. 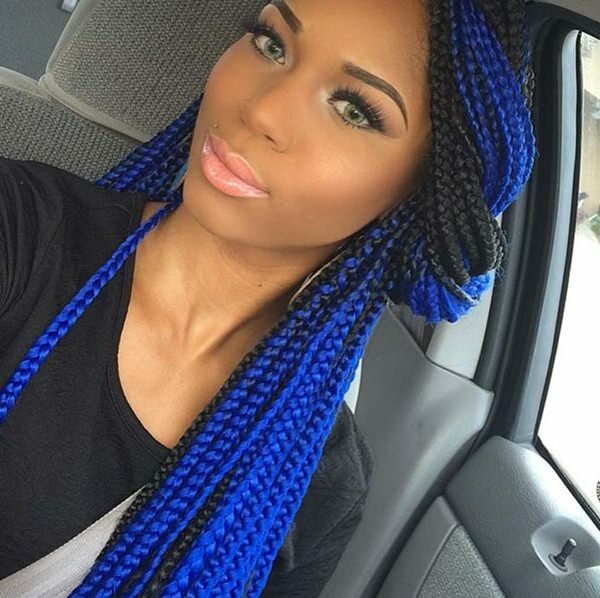 Long braids with a bold blue to compliment the whole look. It’s a stunning design that is sure to please anyone. 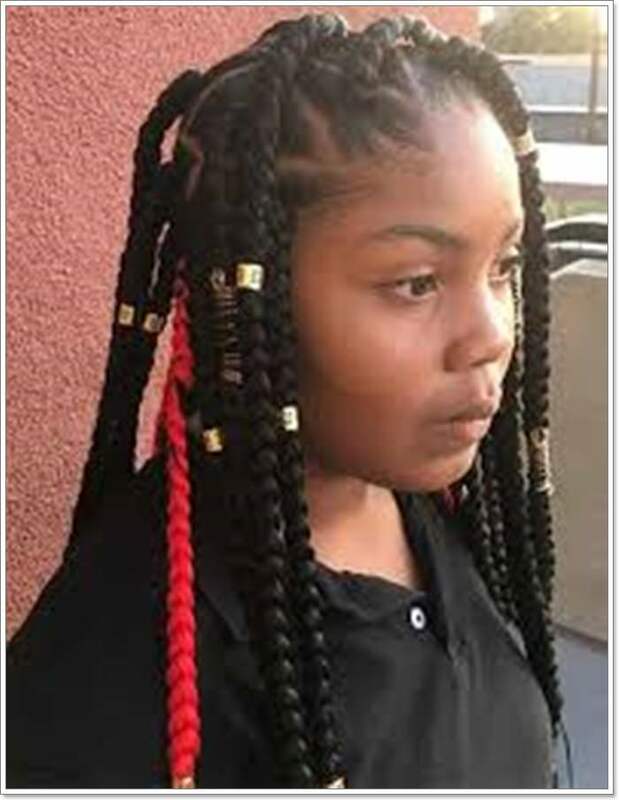 Take care of your braids and they will last a long time. These glossy braids create a stunning updo. You can create a side bang without cutting your hair. These bangs are created just by pulling the braid to one side and then pinning it up. 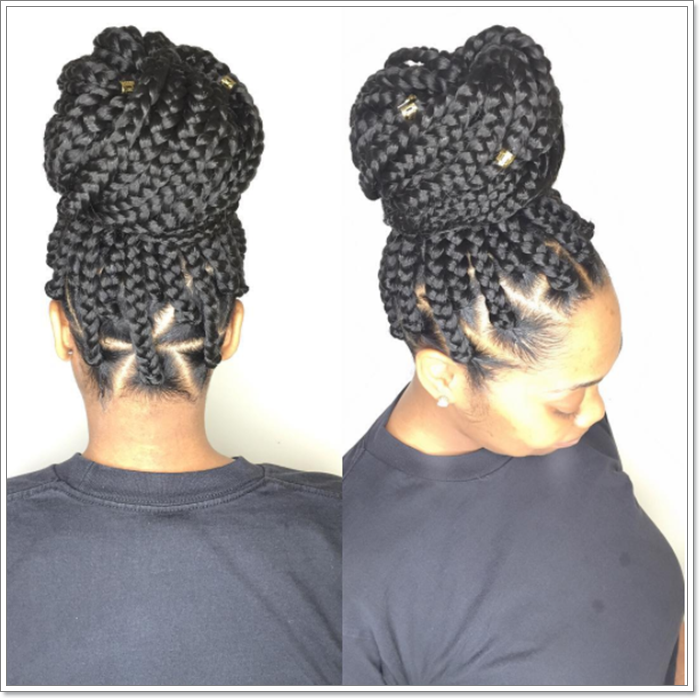 Another great example of the type of updos that you can create with box braids. Getting box braids is a great time to experiment with blonde. Many people avoid it due to the damage it can cause to your hair. 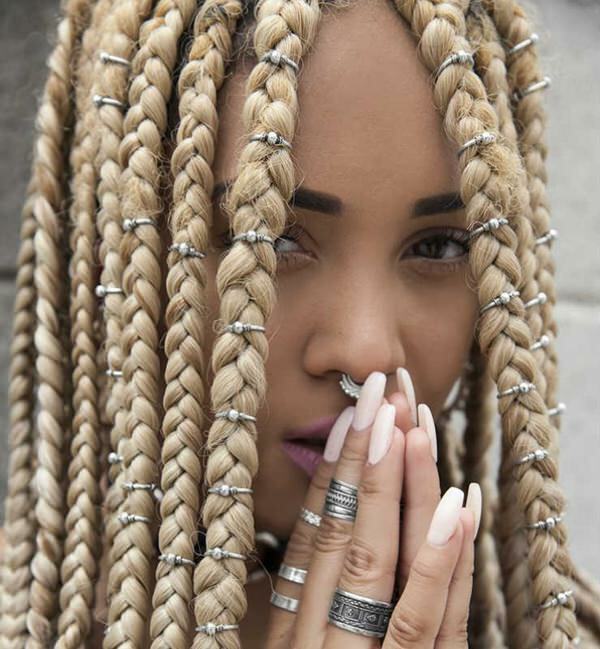 This look is bold not only because of the blonde but also due to the rings throughout the braids. The hair is pulled back into a ponytail, but there is a design that is created at the top of the head. Another great example of the partial updo. This beautiful red coloring is a great color to experiment with. It looks stunning in an updo. 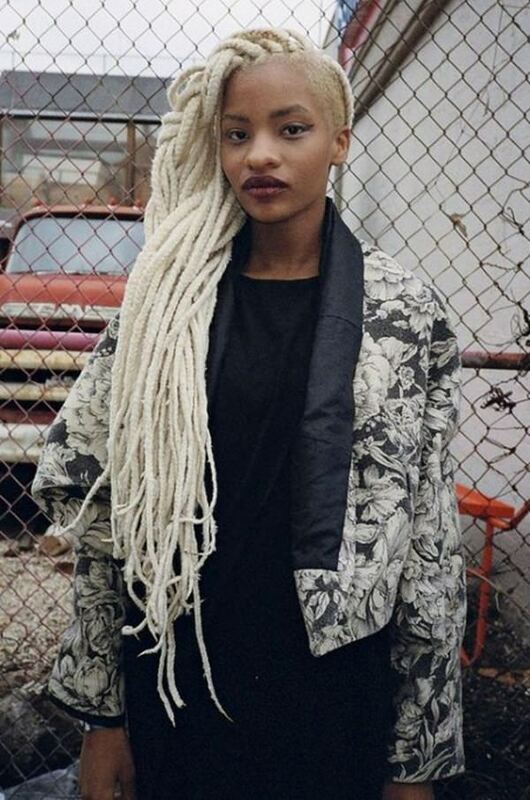 These white locks are stunning and really contrast her skin tone. 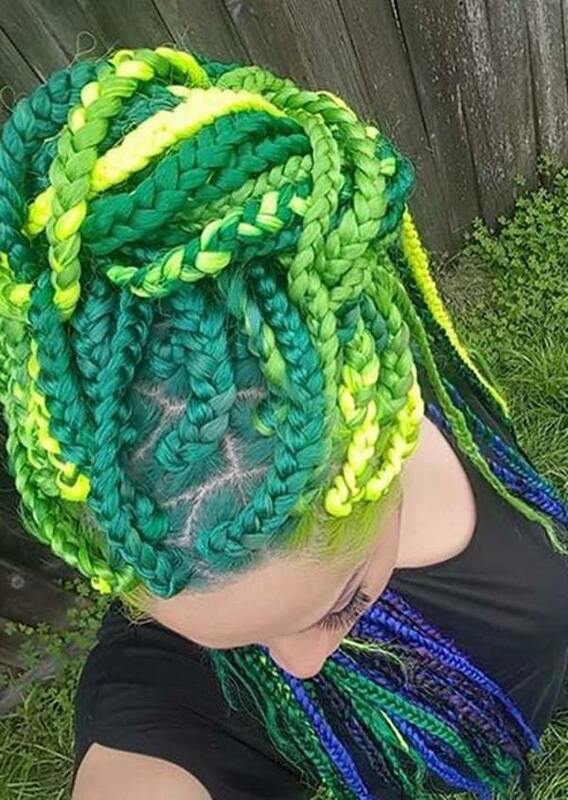 She also has the shaved side which goes well with her bold color choice. I love this soft pink pastel color; it looks great in a partial updo. This partial updo is unique because the top portion is all curved to the side, creating a one of a kind style. This style is rocking for a lot of reasons. It’s left down, but it’s no less stunning than an updo. 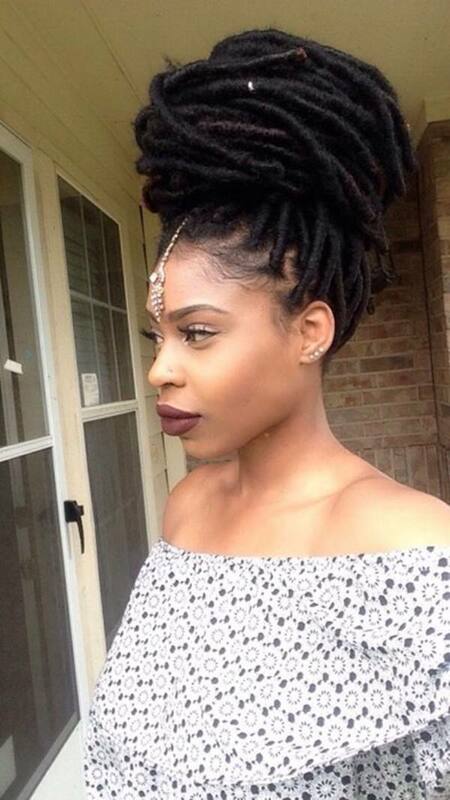 I love all the accessories in her hair that really make her look pop. 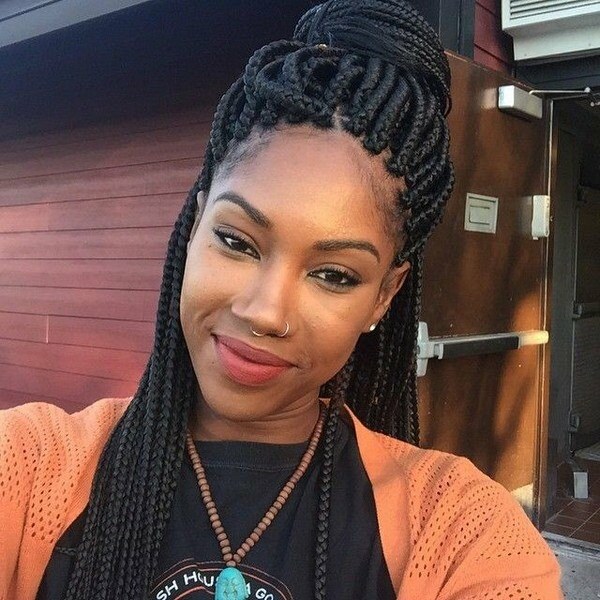 Her braids start off large and go into small designs that are absolutely beautiful. 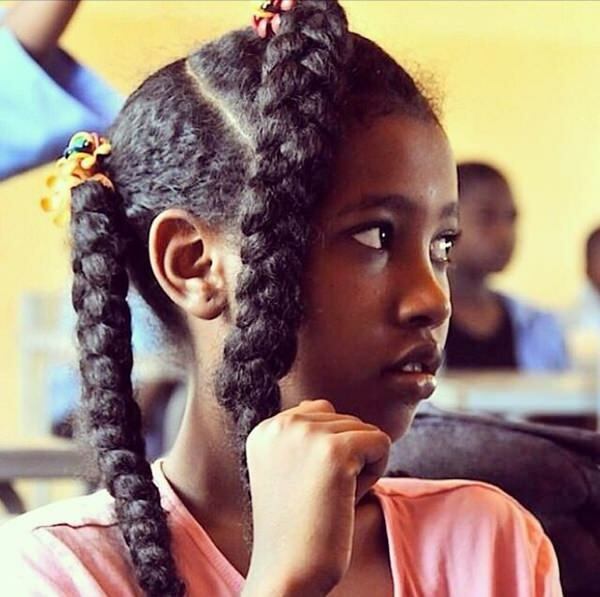 These large pigtails are made from very large braids. The bang is a unique design that really compliments the whole look. This rather voluminous updo is created with twisty braids. There is a lot of hair involved here, and it’s all pulled up to create this large bun. This beautiful updo is made even more unique because of the shaved design in the back of her head. If you are looking for a big change, then try out this design. Another example of the partial updo but this one has beautiful caramel highlights. Design is made at the scalp and then pulled back into an elegant updo. 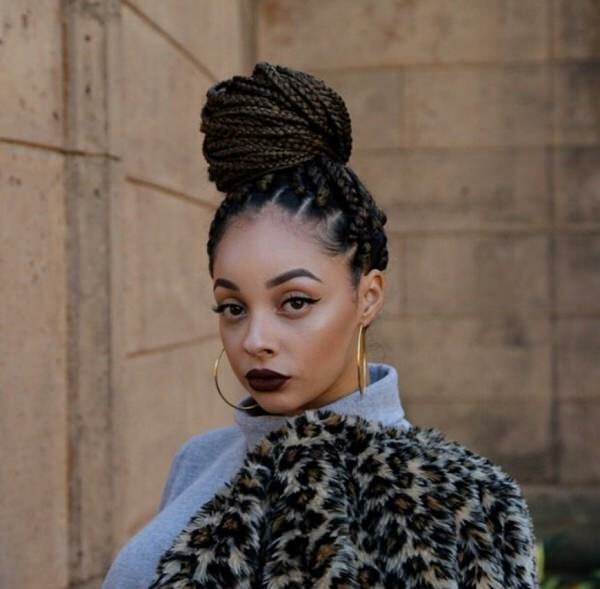 Buns are very popular when it comes to box braids. 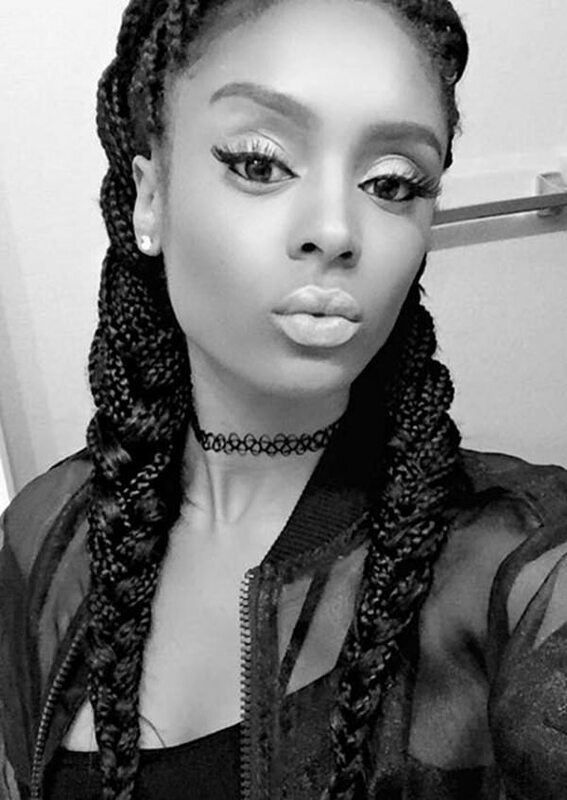 Box braids can be cut for a shorter style. This look really stands out because of her highlights in the front. The contrasting colors are amazing. 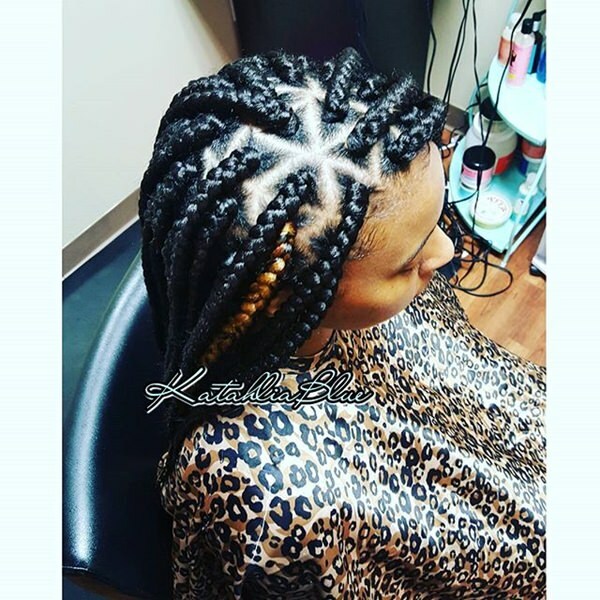 The braids are designed in such a way as to present a star on the side of the head. The rest of the braids are pulled back. Another example of a star design, this one on top of the head. 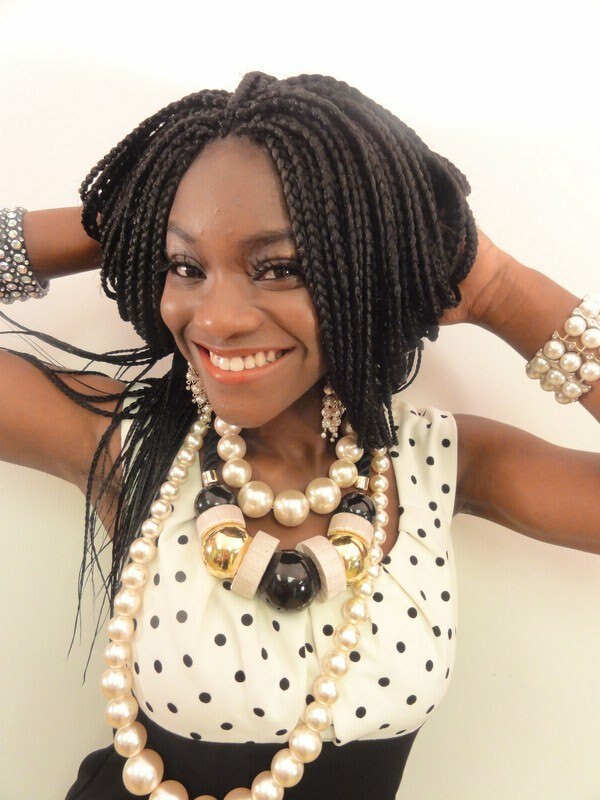 Box braids are great for kids because you don’t have to worry about styling their hair every morning. 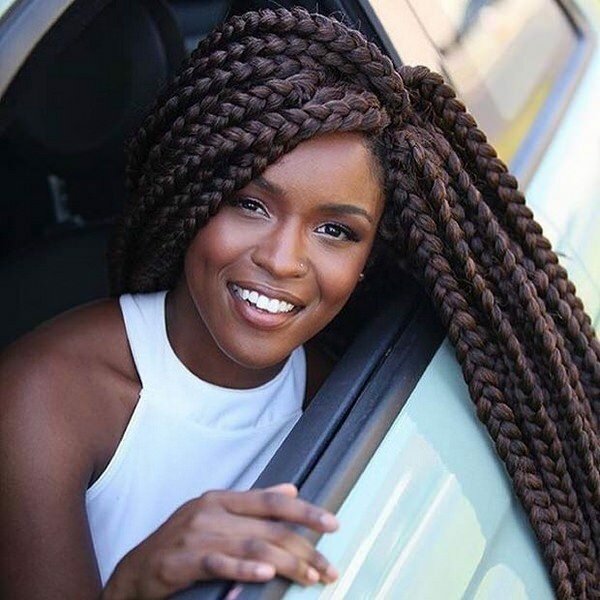 Use large braids for a quick design and don’t worry about it again for months. 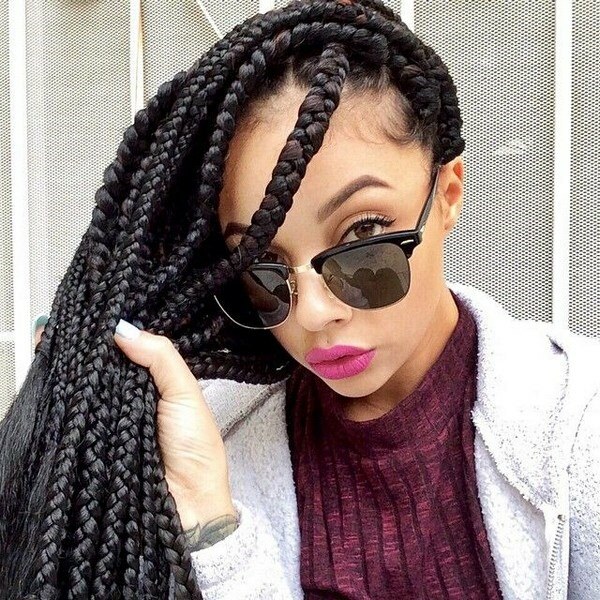 Box braids are a creative way to have a fashionable hairstyle for months on end. Imagine having a creative design that lasts for three months with very little maintenance. All that’s required is a little TLC to maintain the look and keep the hair not only healthy but looking glossy throughout the period of time. The last thing you want is to go to a big expense and spend a lot of time on something that won’t last you. If you take care of your hair properly then you will never have to worry about it until your next salon appointment. 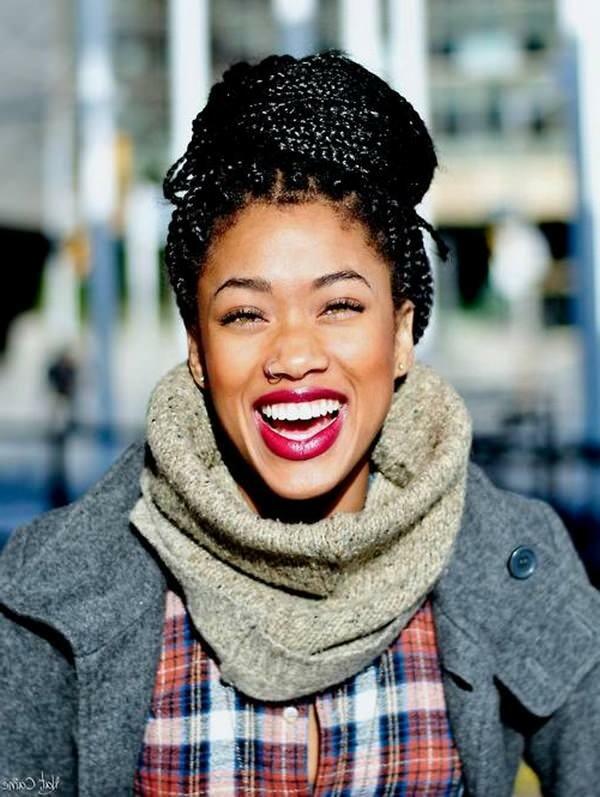 Moisturize your hair regularly and even sleep with a scarf at night to prevent any wear on the style. This will help it to stay in as long as possible so that you get the most wear out of it. It’s especially true when it comes to children as there is always a little more wear and tear to their hairstyles. 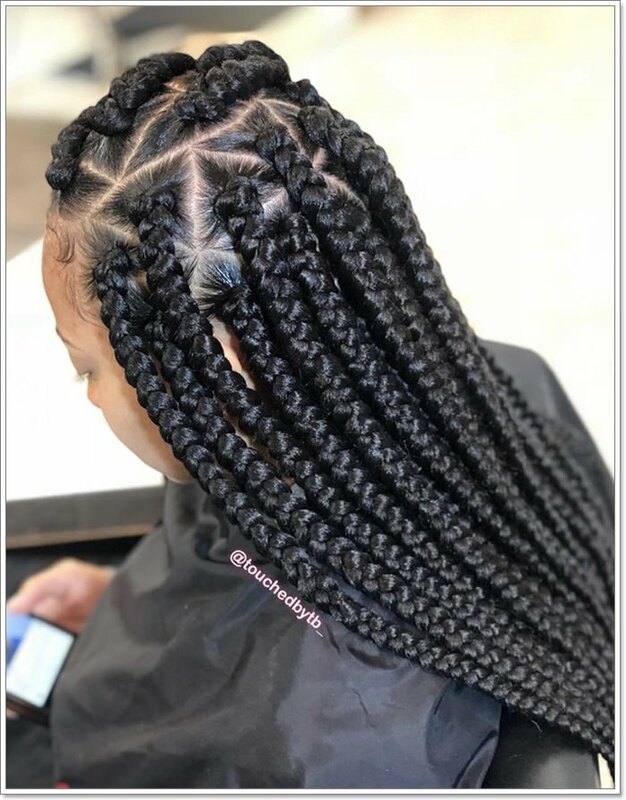 You should expect to pay between $200-$300 for your box braids depending on the stylist that you choose. 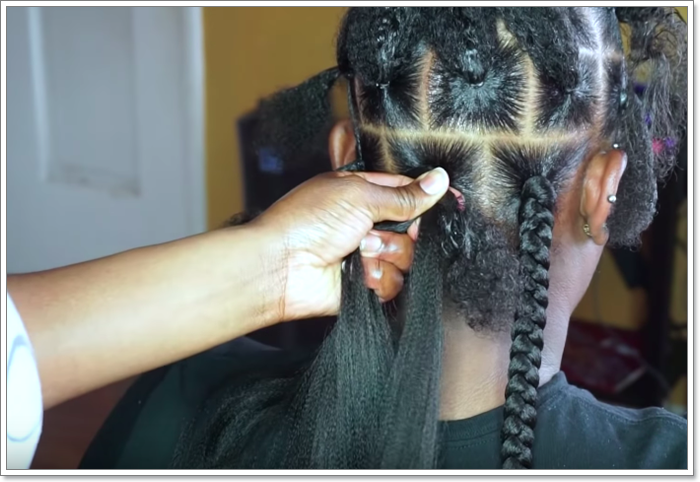 You can save money by buying the braids and doing them yourself. However, it can be quite a hassle if you don’t have any experience with them. It could end up costing you a lot more time and energy by doing it yourself. It’s best to let a professional handle the job. We hope you enjoyed the article! Comment below on your favorite design!